Master student in the Graduate Geotechnical Program, received “Geotechnical Engineering Master Thesis Award”, Taiwan Geotechnical Society. Ph.D. student in the Graduate Geotechnical Program, was selected as one of the ten young outstanding members to present his research paper in the IGS Young Members Forum and awarded a certificate in the 11th International Conference on Geosynthetics in Seoul, Korea. Master student in the Graduate Geotechnical Program, received “Geotechnical Engineering Master Thesis Horonable Mention Award”, Taiwan Geotechnical Society. Undergraduate students in the Undergraduate Student Research Program, received “ Undergraduate Research and Innovation Award”, Ministry of Science and Technology of Taiwan. Undergraduate students in the Undergraduate Student Research Program, received “ˇ3rd Place Prize of the Undergraduate Research Award”, Department of Civil and Construction Engineering, Taiwan Tech. Master student in the Graduate Geotechnical Program, was selected as one of the ten young outstanding members to present his research paper in the IGS Young Members Session and invited to joint the festive dinner in the 10th International Conference on Geosynthetics in Berlin, Germany. Undergraduate students in the Undergraduate Student Research Program, received “2nd Place Prize of the Undergraduate Research Award”, Department of Civil and Construction Engineering, Taiwan Tech. Master student in the Graduate Geotechnical Program, received “International Geosynthetics Society Student Award”, from the International Geosynthetics Society-Taiwan Chapter, and also receive travel grant to the 2012 Geosynthetics Asia Conference in Bangkok, Thailand. 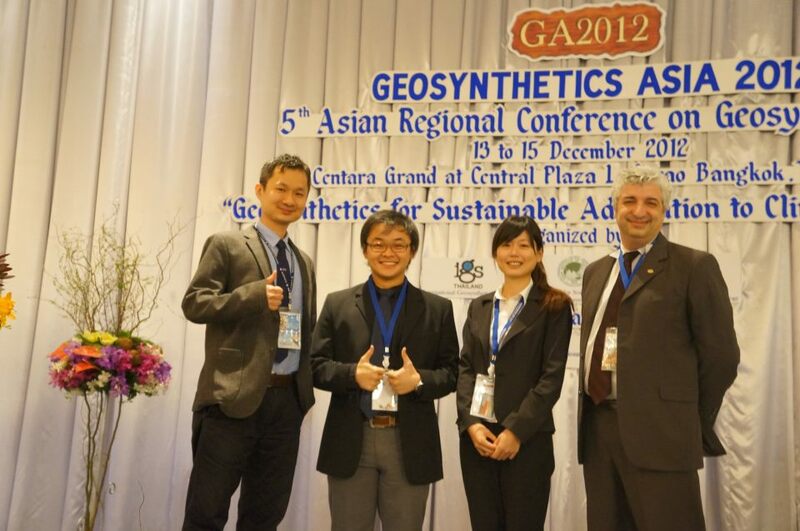 Master student in the Graduate Geotechnical Program, received “International Geosynthetics Society Student Award”, from the International Geosynthetics Society-Indonesia Chapter, and also receive travel grant to the 2012 Geosynthetics Asia Conference in Bangkok, Thailand. Undergraduate students in the Undergraduate Student Research Program, received “1st Place Prize of the Best Undergraduate Student Research Award”, Department of Construction Engineering, Taiwan Tech.